Day three of our driving trip was dedicated to Bryce Canyon National Park. Bryce Canyon has a special place in my travels and in my photography. I consider the park to be the most visually striking and among the most unconventional places I’ve ever visited. It has such an unusual combination of colors and shapes that it is hard to believe the canyon is a natural occurrence and not some modern artist’s funky exhibit inspired by a wide range of hallucinogenic drugs. Even after visiting Bryce Canyon numerous times, it keeps drawing me back again and again. But, visiting the canyon has its own challenges. 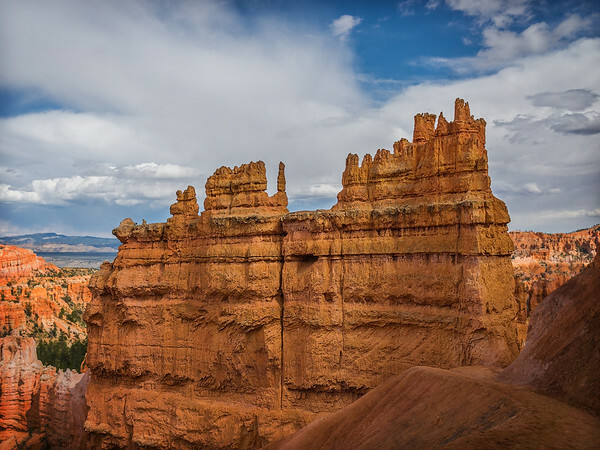 First, compared to other national parks in Utah like The Grand Canyon, Zion, or Capitol Reef, Bryce Canyon is relatively small. But, in recent years, it’s become a very popular destination and it is packed with tourists during its peak season from May to October. The good news is that most tourists are lazy. 90% of Bryce Canyon visitors only explore the park by driving along its 17 miles of paved road, stopping at vista points along the way for pictures. If you start hiking down to the bottom of the canyon, you will find yourself in solitude only in 10 to 15 minutes. 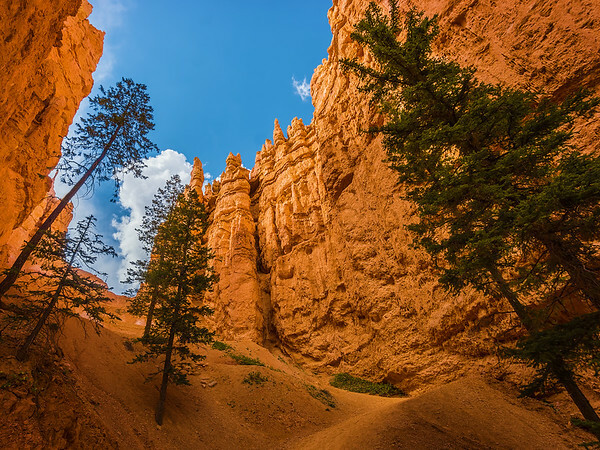 To fully experience Bryce Canyon, you must hike down to the canyon and explore it from the inside. The second challenge in visiting Bryce Canyon is the weather. During my very first trip to Bryce Canyon in the middle of May, I entered the park in the morning wearing a t-shirt with plans to enjoy the warm sunny day. You can imagine my surprise when I found myself in the middle of a heavy snow storm by early afternoon. I had to cut my visit short. The following year, I was chased away by freezing rain and attributed my misadventures to bad luck. 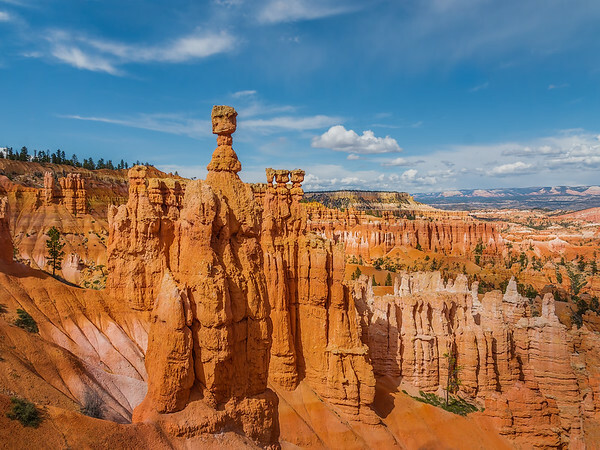 But, I later realized that Bryce Canyon is situated at an altitude between 2,000 and 2,700 meters, which means that even in summer you should expect anything. 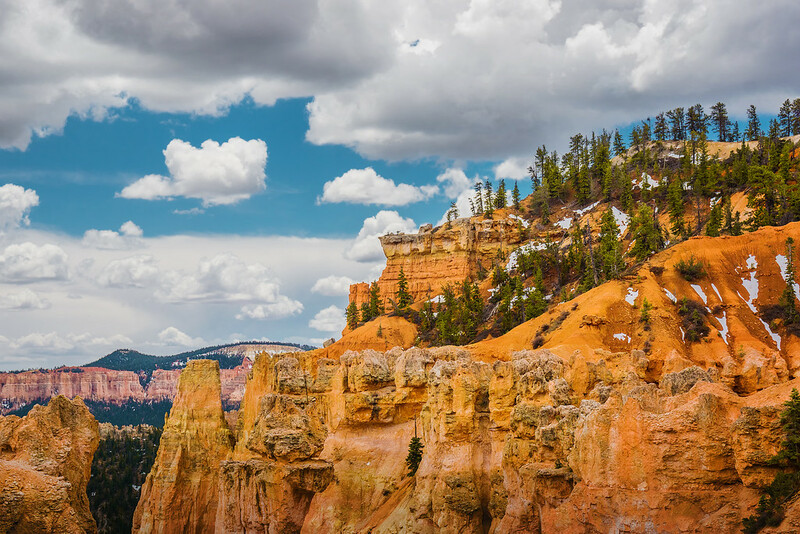 Chances are, if you start exploring Bryce Canyon when the weather is nice, make sure to pack a rain jacket and warm clothes in your backpack. It is a 200km drive from the Stateline Campground to Bryce Canyon and our goal was to ensure we arrived at the park before 9:00 a.m. to beat the crowds. We woke at sunrise and started our regular morning routine by making two batches of coffee using our trusted AeroPress. The AeroPress is a lightweight coffee press that allows you to manually make espresso in just minutes. Over the years, it has become an essential part of all my travels. 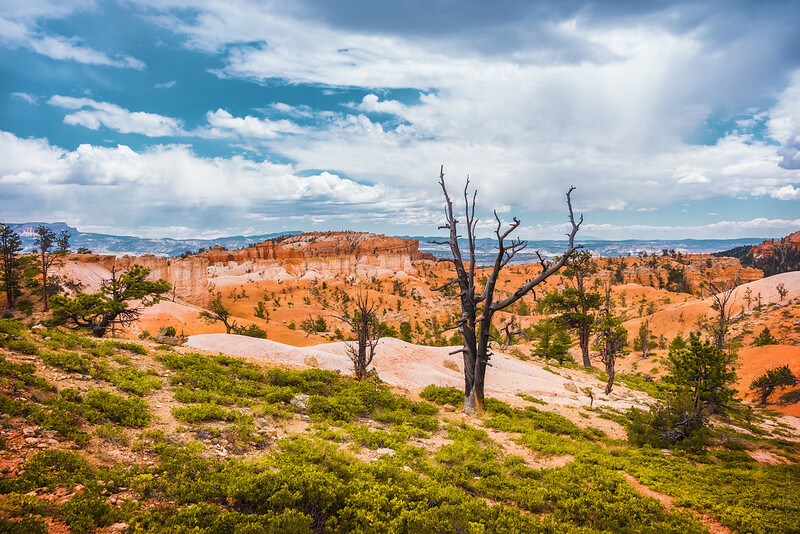 The drive to Bryce Canyon took us from the Vermillion Cliffs National Monument to the Escalante National Monument. It is a spectacular drive and the 200km passed by incredibly fast. In the middle of the drive, I realized that I had once again miscalculated our arrival time. Arizona and Utah belong to different time zones. When you cross the state line from Arizona into Utah, you change from the Pacific to the Mountain time zone. I learned this a long time ago, but I still fall into the same time zone trap again and again. While traveling to the southwest, it is common to cross the Arizona-Utah state line multiple times throughout the day. The time zone change always complicates things for photographers attempting to calculate the sunrise and sunset. This means that instead of arriving at Bryce Canyon at 9:00 a.m., we arrived around 10:00 a.m. and the park was already full. Our final destination was Sunset Point, which we had to circle for 20 minutes just to find an available parking spot. The Red Canyon on the way to Bryce. 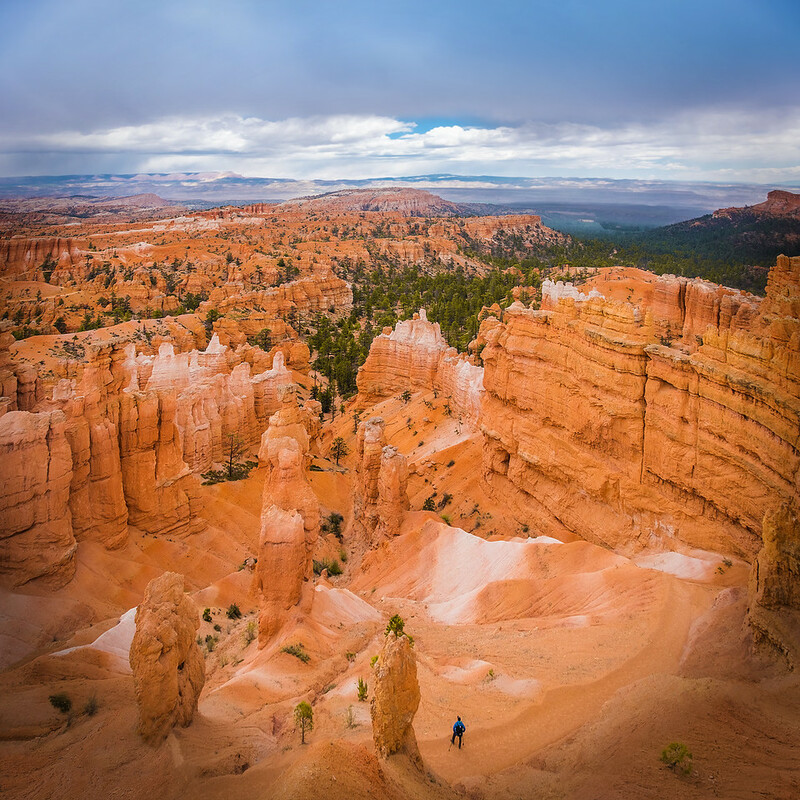 Since there are so many exciting places to visit in Bryce Canyon, it can be overwhelming when you visit the park for the first time. 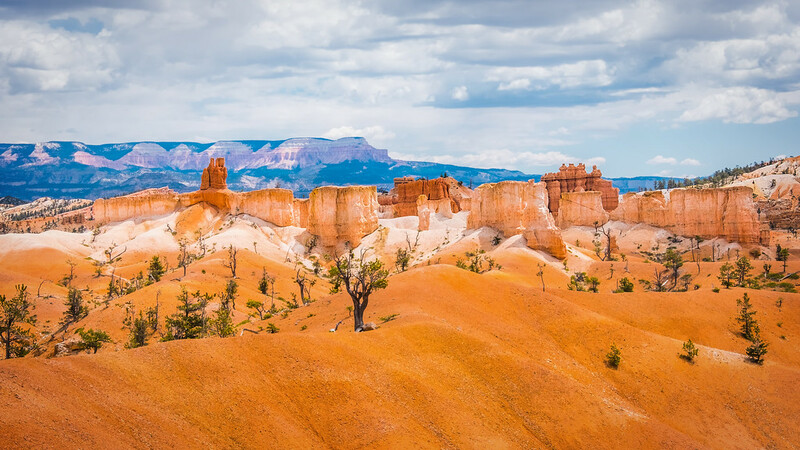 After visiting Bryce Canyon on numerous occasions, I would like to share with you a few tips on how you can get the most out of exploring the beautiful park. 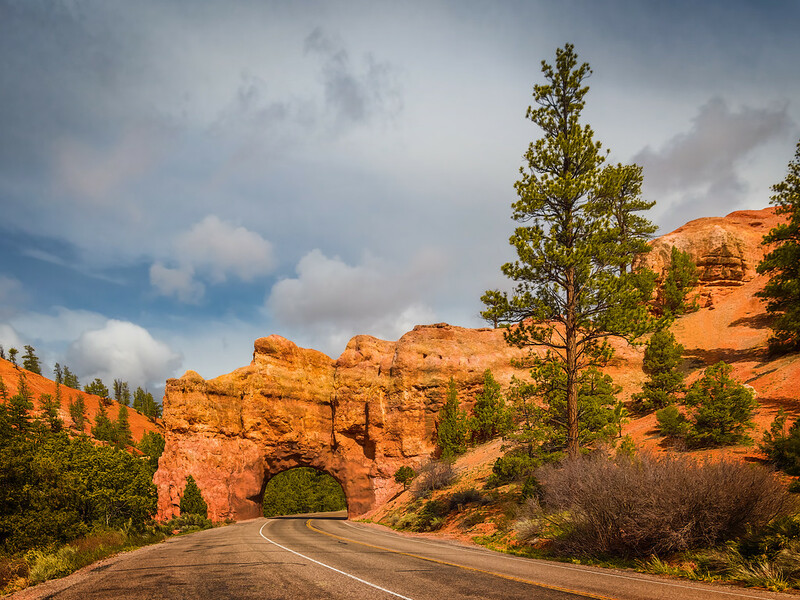 If you only have a couple of hours to spare while visiting Bryce Canyon, drive the 17-mile Road 63 that winds along the rim of the canyon and takes you from one observation point to another. You will see and photograph some of the most iconic spots in the park like the Amphitheater and the Natural Bridge. If you have an extra hour after completing the drive along the rim, visit Sunset Point. Take the short Navajo Trail, which takes you all the way down to the bottom of the canyon and back. You will experience the famous switchbacks of Wall Street. If you have an extra two to three hours, take a combination of the Navajo and Queen’s Garden trails. This is a 4km loop trail that takes you to the bottom from the Sunset Point. After hiking at the bottom of the canyon, you climb up at Sunrise Point. Then, you can complete the loop by walking from Sunrise Point to Sunset Point along the rim of the canyon. This is one of the most popular trails in the park, so it can be especially crowded in the middle of the day during peak tourist season. 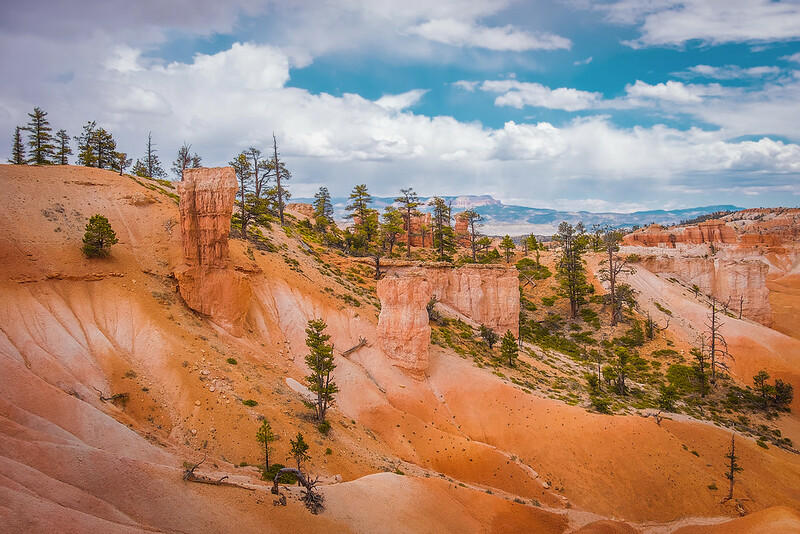 If you have an entire day to spare at Bryce Canyon, add the Peekaboo Loop Trail to your itinerary. 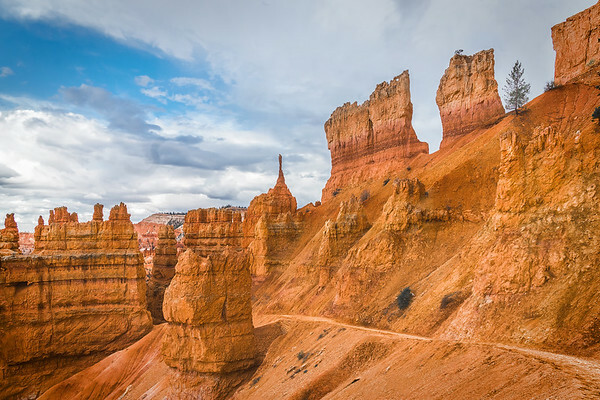 It is a longer and a more demanding hike, but you will get the full experience of Bryce Canyon. If you have dedicated multiple days to exploring Bryce Canyon, you probably do not need my help. You will have plenty of time to combine multiple trails into your personal and customized itinerary. And, if you are adventurous enough, you can even camp at the bottom of the canyon. Just remember that you will need a permit to camp overnight. In our case, we hiked down from Sunset Point and spent the rest of the day exploring the less-visited corners of the canyon without following any specific trails. Once again, the most challenging part of the hike was the weather. It was a humid and hot day, but a short cold rain started at least 10 times throughout the day. We had to go through the routine of constantly putting on and taking off our rain gear time and time again. I started the hike with the Fujinon 10-24mm f/4 lens attached to my Fujifilm xT3. But, since my favorite wide-angle lens is not weather sealed, I had to hide it every time it started raining. After a few hours of this routine, I was fed up. I swapped the 10-24mm lens with the 18-135mm lens that is weather sealed and spent the rest of the day taking multiple shots for wide-angle panoramas. burned in the recent Carr fire in the Redding area. Spent 12 days in this part of the world with another 3 members of Dunfermline Camera Club from Scotland in May this year. Started in Las Vegas then to Valley of Fire, 3 days in Zion then Bryce. Had a day in Goblin Valley before visiting Arches National Park for a couple of days, finishing up at Horseshoe bend and Antelope and Rattlesnake Canyons. What a trip, awesome scenery and met lots of great people.Hoping to go back in 2020 and explore it a bit more! Amazing photos of an amazing area! I can’t find Day 05, please check the link to that day. thanks for letting me know. It is fixed now.